The mountain dulcimer is a wonderful instrument — an authentic Appalachian folk instrument that is light enough to travel with you anywhere and easy to play, but will provide a lifetime of enjoyment. 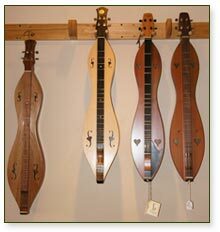 Dulcimers are available in a range of styles, from teardrop to fiddle back, and in a variety of woods. We carry dulcimers for everyone from beginners to advanced players, and are always happy to demonstrate this wonderful and versatile instrument. And we would be happy to help you select just the right instrument for yourself or as a gift. Mary and Rich both play the mountain dulcimer and beginners classes are available. Pinelands also carries mountain dulcimer supplies — including strings, which have a habit of breaking from time to time! We carry instructional books and CDs as well, for those who would like to learn at home in their spare time. And, believe it or not, there are many, many workshops, all over the country, that include classes in mountain dulcimer. Check out our Instrument Links page to see a few. Mary is also available for music demonstrations at schools, nursing homes and private venues. Please get in touch with her by phone (609-518-7600) or email if you would like to arrange a demonstration.